One of our readers, Ellen, is Project Manager for Governors Island Preservation and Education Corporation and we were excited to hear how GIPEC is 'Copenhagenizing' Governors Island, off the southern tip of Manhattan. We’re 'Copenhagenizing' a 172-acre island in the middle of New York Harbor by banning private cars, being super welcoming to cyclists and letting people borrow bikes for free. By “we”, I mean GIPEC, the state agency responsible for planning and operations on this former military base. Our official mission really isn’t to Copenhagenize Governors Island, but a huge increase in our bike numbers has been a very cool by-product of our efforts to bring the Island back to life. So, far it’s working. We’ve doubled the number of visitors over last year and quadrupled over the year before. The New York Times had a great piece about us recently. On an average day here, more than 20% of our visitors are riding bikes, and on a Friday, when our bikes are free, 36% of our visitors ride bikes. The folks who ride here are mostly normal people (for New Yorkers anyway), riding cruisers in their street clothes. They come for our arts programs, concerts, festivals and views. We have a great program called “Free Bike Fridays,” sponsored by Transportation Alternatives, which lets people borrow a bike from a Bike and Roll bike rental station for free, for up to one hour. After the first hour, the bikes are $5 for ½ hour, $10 up to two and $15 all day. It’s been hugely popular and we’re expanding it this weekend (9/19-9/21) so more people have a chance to ride bikes on our car-free streets. 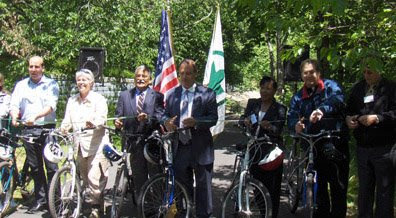 Here’s a little more info about Free Bike Weekend on the Governors Island Blog. Thanks to Ellen for letting us know about this great initiative in NYC. If any of our readers get to the island, please take some photos and mail them to Copenhagenize.com. We think he's the guy in the middle, betwen the flags. The NYC Parks Commissioner, Adrian Benepe, has just been in Copenhagen to get inspiration for more bicycle traffic in New York. Adrian Benepe intends to use a part of the city’s one billion budget to bring the bicycle traffic in his town on the same level as in Copenhagen. He has just visited Copenhagen invited by the Forest and Landscape unit at the University of Copenhagen with the aim of exchanging experiences within public and private park management. "My goal is to create as good conditions for cyclists in my town as those you have here in Copenhagen. It will not be easy because although the New Yorkers are beginning to consider the bicycle as a mean of transport there is still much to wish for with regard to our bike culture. ", says Benepe. Read more about his visit and observations on the Copenhagen Capacity website. And keep us posted on whether or not he is on track towards his stated goals, as above. Nothing to do with NYC, but here's a little youtube advert for Cykeltaxa - cycle taxi - in Copenhagen.